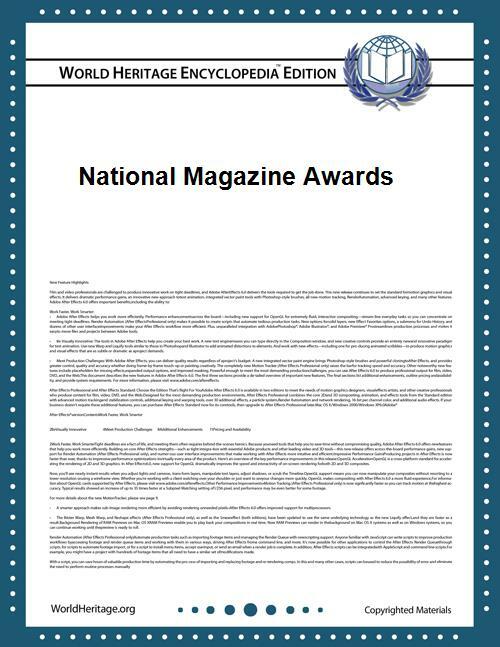 The National Magazine Awards are a series of American awards that honor excellence in the magazine industry. They are sponsored by the American Society of Magazine Editors and administered by the Columbia University Graduate School of Journalism in New York City, New York. The awards have been presented annually since 1966. They are generally considered the highest award in the magazine industry; in the magazine world, they are roughly equivalent to the Pulitzer Prizes (which are far more widely known in the popular culture, but do not include a magazine category). Recipients of awards are selected in a two-step procedure: First, entries are reviewed by a judging panel, which recommends a group of finalists; then, a second panel of judges chooses one winner in each category. Winners in each of the categories are awarded an "Ellie", a copper-colored stabile sculpture by Alexander Calder, resembling an elephant, which is manufactured by New York firm Society Awards. The National Magazine Awards web site has a searchable database of all the winners and top-five finalists. Honors print and digital magazines in six categories based on content and audience. received the first ever award in 1973. No award was given from 1974 to 1980. When General Excellence returned as a category in 1981, it was given to four magazines per year until 1998, when five magazines received General Excellence awards. Six magazines received awards in 2002. From 2003 to 2010, the award went to seven different magazines and in 2011, to eight. Since 2012, the award has gone to six magazines. Previously known as Visual Excellence (1970-1979). Honors overall excellence in print magazine design. Honors overall excellence in print magazine photography. Previously known as Photo Portfolio/Photo Essay (2004-2006) and Photo Portfolio (2007-2010). Honors the use of original photography in a feature story, photo-essay or photo portfolio. Honors magazines that have devoted a single issue to the comprehensive examination of one subject. No award was given in 2000 or 2001. Honors a regularly published front- or back-of-the-book department or section. Previously known as Service to the Individual (1974—1985). Honors the use of print to serve readers’ needs and aspirations. No award was given in 1981. Previously known as Special Interests (1986-2001). Honors the use of print to provide practical information about recreational activities and special interests. Honors magazine websites and online-only magazines. Previously known as Mobile Media (2010), Mobile Edition (2011) and Tablet Edition (2012). Honors magazines published on tablets and e-readers, including digital-only magazines. Previously known as Multimedia Feature or Package (2010) and Multimedia Package (2011). Honors digital storytelling and the integration of magazine media. Honors the outstanding use of video by magazines published on digital platforms. Known as Public Service (1970-1985). Honors magazine journalism that illuminates issues of national importance. No award was given in 1973. Previously known as Reporting Excellence (1970-1980) and New Reporting in 1988. Honors reporting excellence as exemplified by one article or a series of articles. Honors original, stylish storytelling. Incorporates Profile writing as of 2013. Category previously known as "Criticism & Belle-Lettres" (1977) and Essays (2000–10). Honors "long-form journalism that presents the opinions of the writer on topics ranging from the personal to the political". Honors political and social commentary; news analysis; and reviews and criticism. Previously known as Fiction & Belle-Lettres (1974 -1976). Honors fiction originally published in magazines. Honors magazines for editorial excellence as demonstrated in print and on digital platforms for the quality and consistency of magazine-branded content and services produced by or associated with the publication, including but not limited to conferences and events; books; and radio and television programs. For the first four years of the National Magazine Awards, only one award was given. American Machinist Magazine, a McGraw-Hill trade publication, which was recognized for its special issue, “Will John Garth Make It?” The study of U.S. industry’s role in combating unemployment, especially among those that companies might consider unemployable, included Mr. Garth, a 26-year-old high school dropout and parolee. Identifying one winner was no doubt a challenge for the judges in the first years of the National Magazine Awards. It was decided from the start that Certificates of Special Recognition as well as commendations would be given. Motive “for editorial vitality, for tasteful innovation in design, and for forthright treatment of delicate issues that once would have been taboo in religious-affiliated publications"
Nine titles were commended at the first annual National Magazine Awards. This was the only year such recognition was given. The New Yorker “for its skillful editing and for its flair for dramatic innovation as demonstrated by its publication of Truman Capote’s ‘In Cold Blood.’"
1989 Robert E. Kenyon, Jr. Previously known as Profiles (2000-2001). Honors excellence in profile writing by recognizing the vividness and perceptiveness with which the writer brings his or her subject to life. Honors excellence in criticism of art, books, movies, television, theater, music, dance, food, dining, fashion, products and the like by recognizing the knowledge, persuasiveness and original voice that the critic brings to his or her reviews. Previously known as Photojournalism (2007-2010) and News Photography (2011-2012). Honors excellence in the informative photographic documentation of an event or subject in real-time. Honors overall excellence in the design of magazine websites and online-only magazines. Previously known as General Excellence in New Media (1997-2000), General Excellence Online (2001-2009) and General Excellence, Digital Media (2010-2013). Previously known as Best Interactive Design (2001). Honors overall excellence in the design of magazine websites and online-only magazines. Previously known as News Reporting (2010-2011). Honors overall excellence in the design of magazine websites and online-only magazines. Previously known as Interactive Service (2007) and Personal Service Online (2008-2008). Honors a site’s effective use of multimedia technology to deliver information that users can act on to improve the quality of their personal lives or enjoy recreational pursuits. Previously known as Blogging (2010-2011). Honors excellence in opinion journalism on digital platforms. Previously known as Regular Department or Section (2010) and Online Department (2011). Honors a regularly updated, clearly branded department or channel. Previously known as Interactive Feature (2007-2009) and Interactive Tool (2010-2011). Honors an outstanding app, feature or section of a website that uses multimedia technology, tools, community platforms or other interactive formats to deliver or share content such as news, information and entertainment, rather than practical instruction or advice. Honors outstanding audio podcasts on a magazine website or online-only magazine. ^ Carmody, Deirdre (April 17, 1992). "National Geographic and New Republic Win". ^ Keith, J. (March 15, 2007). "Ellie Picks Nominated". ^ Neuffer, Elizabeth (April 23, 1987). "13 Prizes Awarded for Magazine Excellence". The New York Times. ^ "The Atlantic Receives 3 Magazine Awards". NYTimes. April 29, 1988. Retrieved April 27, 2015.